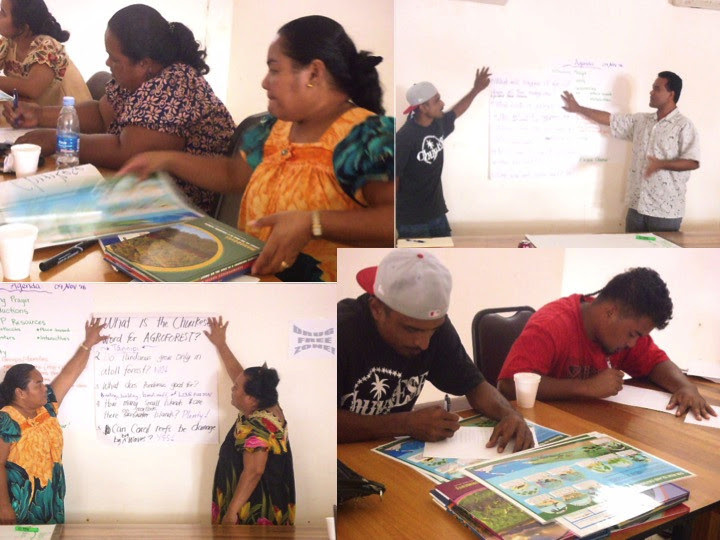 On November 9, 2016, teachers from the Northern Namoneas Region in Chuuk, Federated States of Micronesia participated in a workshop on the various PCEP resources available for the classroom. The workshop was facilitated by Pacific Resources for Education and Learning (PREL) Staff Canita Rilometo (Pohnpei) and Dorsalina William (Chuuk), with assistance from Diana Manuel (Chuuk PREL). In attendance were 2 teachers from each of the elementary schools located on Weno, Chuuk, as well as members from the Chuuk Local Professional Learning Community, including Wisney Nakayama (Chuuk State Legislature Representative) and Rachael Akapito (Climate Adaptation, Disaster Risk Reduction, and Education Program of the International Organization for Migration [IOM]). In total, there were 11 participants. The workshop started off with participants introducing themselves and sharing what they know about their clans, which led to a discussion about place-based approaches to education—learning about who you are and where you are from. Throughout the workshop, PREL staff guided the participants in exploring activities using the Low and High Island Posters and the Place-Based Resources for Pacific Islands Schools book series. The participants interacted with each other in their different groups, sharing many ideas. The workshop was a success, creating a foundation for a follow-up workshop in January 2017. Participants of the workshop expressed their interest in learning more about the available PCEP resources, having seen the relevance of these resources to our island life. PCEP and PREL acknowledge IOM for their partnership with the workshop, especially in providing tote bags with Climate Change and Disaster Preparedness materials for the participants.